In the summer of 1865, a former slave by the name of Jourdan Anderson sent a letter to his former master. And 147 years later, the document reads as richly as it must have back then. The roughly 800-word letter, which has resurfaced via various blogs, websites, Twitter and Facebook, is a response to a missive from Colonel P.H. Anderson, Jourdan’s former master back in Big Spring, Tennessee. Apparently, Col. Anderson had written Jourdan asking him to come on back to the big house to work. In a tone that could be described either as “impressively measured” or “the deadest of deadpan comedy,” the former slave, in the most genteel manner, basically tells the old slave master to kiss his rear end. He laments his being shot at by Col. Anderson when he fled slavery, the mistreatment of his children and that there “was never pay-day for the Negroes any more than for the horses and cows.” Below is Jourdan’s letter in full, as it appears on lettersofnote.com. 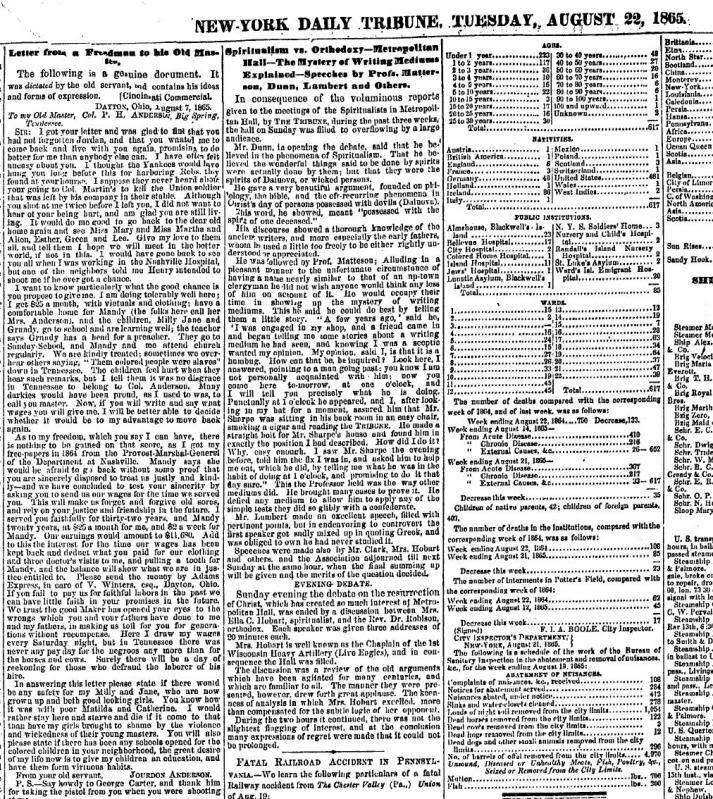 To take a look at what appears to be a scan of the original letter, which appeared in an August 22, 1865 edition of the New York Daily Tribune, click here. As Letters Of Note points out, the newspaper account makes clear that the letter was dictated. After reading the letter attributed to Jourdon Anderson, Michael Johnson, a professor of history at Johns Hopkins University in Baltimore, did a bit of digging into old slave and census records. He says he has discovered evidence that the people involved in this correspondence are real, and that the letter is probably authentic. According to Johnson, the 1860 federal slave schedules list a P H Anderson in Wilson County, Tenn., with 32 slaves; several of them credibly the people mentioned in the letter, of the correct genders and ages, Johnson said, though the names of slaves were not listed in the schedules. “That in itself is not conclusive proof that the letter is real, but the slave owner was real and he had plenty of slaves,” Johnson wrote in an email to The Huffington Post. Johnson said better evidence that the letter is almost certainly real is that, according to the 1870 federal manuscript census, a Jourdan Anderson, his wife and four school-age children are listed as living in the 8th ward of Dayton, Ohio. Johnson said the records state that Anderson is a hostler, 45, and that he and his family are listed as “black.” Furthermore, according to those records, Anderson, his wife and two older children, ages 19 and 12, were born in Tennessee. Two younger children, ages 5 and 1, were born in Ohio, “which would in turn have him and his family showing up in Ohio at about the right time to have escaped during the Civil War,” Johnson said. The professor said that Jourdan Anderson could not read or write, according to 1870 manuscript census. But the letter could have been written by his 19-year-old daughter, Jane, who was listed as literate in 1870. “The letter probably reflected his sentiments,” Johnson said, who added that Anderson lived in a neighborhood surrounded by working-class white neighbors who were literate, according to the census. It is also possible one of them may have written the letter for him, Johnson said. But the person who most likely wrote the dictated letter is another person listed in Anderson’s letter. In the letter Anderson refers to a V. Winters. According to Johnson a person by the name of Valentine Winters, a “barrister” in Dayton’s 3rd ward who claimed property worth $697,000, also appears in the 1870 federal census. “He may well have been the person who actually wrote the letter since he is the person Jourdan Anderson asks his former master to send his wages to,” Johnson said. I want to know particularly what the good chance is you propose to give me. I am doing tolerably well here. I get twenty-five dollars a month, with victuals and clothing; have a comfortable home for Mandy,—the folks call her Mrs. Anderson,—and the children—Milly, Jane, and Grundy—go to school and are learning well. The teacher says Grundy has a head for a preacher. They go to Sunday school, and Mandy and me attend church regularly. We are kindly treated. Sometimes we overhear others saying, “Them colored people were slaves” down in Tennessee. The children feel hurt when they hear such remarks; but I tell them it was no disgrace in Tennessee to belong to Colonel Anderson. Many darkens would have been proud, as I used to be, to call you master. Now if you will write and say what wages you will give me, I will be better able to decide whether it would be to my advantage to move back again. Very informative an educational. I admire the respect and the wit shown in the response to the master.